Each June I make my pilgrimage to the mountain. An erstwhile Buddhist, I follow the river roads up through small New England towns, my own version of Basho’s journey north to the interior. I-91 to I-89 to 103 to 100 to 125—it’s the combination to my life that unlocks many things. By now, I must know every shutter on every window of each little house I pass. Certain trees have acted as mile markers over the years. A crooked barn with its swayback roof has continued to decay before my eyes. Chickens peck along the shoulder of Route 103 oblivious to the traffic like a row of white stones left along the roadside as a rite of way. I slow down to witness the most uninteresting scenic views. A pond dotted with yellow lilies. Someone’s new fence. Or just how the rocks—thrown by the spring thaw—have landed in the river. No passenger would tolerate my interior monologues. But it’s okay, I travel alone. A monk on retreat. A teacher on sabbatical. There’s the freedom of being a kid at recess. And I no longer try to contain myself. Soundlessly, but for the open windows in the car, I drive north for the summer. There’s the wind. Occasional singing. The scent of early mowing. I meander through mill towns up and over Bethel Mountain Road, a shortcut that only works in the balmy times. You wouldn’t want to negotiate some of those hairpins in December. Now, it’s all smooth sailing. I mean except for the remnant frost heaves here and there I’ve learned to look out for. Nature’s speed bumps. And they’re right—what’s the rush anyway. Eventually, I make my way down into Rochester for a fill-up and a vanilla creemee to kick things off. Life’s little rituals. North through the happiest little valley that’s right out of central casting for “The Happiest Little Valley.” Gets me every time. I imagine what it must’ve been like to live in one of the farmhouses when the road was dirt. Before the endless summer traffic of out-of-staters. There must’ve been no need to ever leave. Food in the field. Sun in the sky. Neighbors far and near enough to come dance in the barn on a Saturday night. Once I’m past Hancock I realize that I have a chronic commitment to the mountain and the pilgrims who gather here each summer. This is my 30th consecutive trip to Bread Loaf in a lifetime of just past 50 summers. Bread Loaf satisfies the need to escape and come home at the same time. Mine is not a flight from unhappiness but a migration all the same—for the sake of itself. The act of traveling, arriving, and returning. In doing so maybe I have contributed to some bigger purpose. Maybe I’m an odd bird who found his flock a long time ago and recognized them for what they were: family. A species of other odd birds. Maybe I’ve simply enjoyed the ride. By following the exact same route each June, I believe the course of my life has been changed. 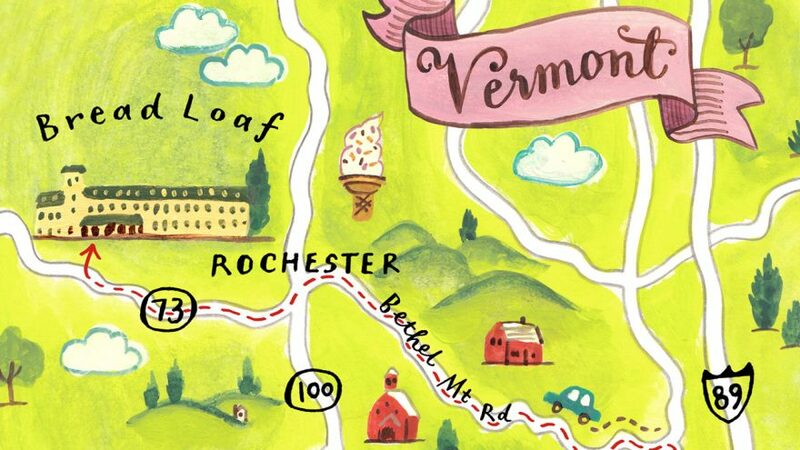 There’s an ebb and flow to the roads up in Vermont. A banking to the left and the right that I feel in my body. These are the elements I’m made of. Blueberries come July. Raspberries sooner still. And mountainous clouds. I place these words one beside the other as a quiet tribute to the place. A sign for those who might notice that I am on the way.